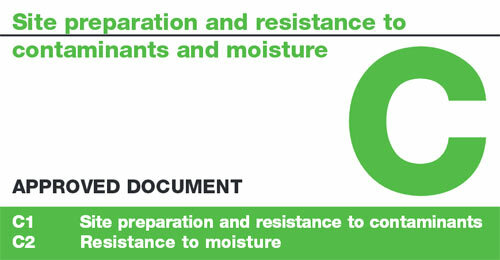 The Building Regulations Approved Document C covers the preparation of a building site and the treatment and clearance of unsuitable materials and contaminants that may be present on the site or in the soil.These regulations discuss the resistance of walls to weather and ground moisture with examples of damp proofing and ventilation provisions to prevent damage to the building and its materials by water. Additionally, Document C also discusses preparing a construction site that may have contaminants present in the soil or surroundings and how they should be properly removed or blocked to prevent them causing future structural issues. Waste disposal such as household waste has remained a problem in the UK and other countries for many years and there are now quite a few disused landfill sites dotted around the UK that are now being reclaimed for use as construction land and this and similar contaminated land situations is where Approved Document C comes in to play. When building on land that could contain contaminants e.g. old scrap yards, it must be ensured that all harmful substances that could have seeped into the soil are removed or treated to neutralise them before construction can begin. The same goes with landfill sites – over time harmful gases such as Methane and Radon can build up so they need removing. There is one more sub-section to part C1, sub-section (4). This helps to define what is meant by the word "contaminant". It states that a contaminant should be considered as any substance that could be harmful to the building and any person in or around it and should include toxic, flammable, radioactive and corrosive items. In some cases, the owner or developer of a piece of land will be well aware of its previous usage due to initial research that should be carried out prior to purchase and a decent survey of the land and its surroundings that should be carried out during any planning application process, should highlight any potential contamination risks that might exist. In the event that contamination is likely you should consult with your local building control department as they should be able to advise what steps will need to be followed in order to make the ground safe for the construction to begin. In terms of the guidelines, these are stated in the Town and Country Planning Acts and also by your local authority, which should use the National Planning Framework for guidance. In some cases Environmental Protection and the Environment Agency may also become involved, but this will depend on the situation. Due to the fact that pretty much every site, location, geological makeup etc…. can be potentially different the above steps are subject to change and each investigation will most probably be tailored to suit the site and location it is to be carried out on. When it comes to treating and resolving contaminated ground there are numerous methods of doing so such as biological and chemical treatments and also some physical. Each treatment can have a different effect but in general they will either decrease toxicity levels, concentration, mass or its ability to move. The correct treatment to use is very much down to the type of contaminant, its location, concentration etc…. and due to this will certainly need expert advice. In general, it will either need containing or removing – containment in the normal sense usually means surrounding an area to prevent its spread or escape but in construction this normally means so kind of covering. Covering normally involves layering one or several layers of material over an area to reduce contamination levels, produce geotechnical improvements, break a supply etc…. In some cases the construction of the ground floor and its foundations can help go towards this. Due to the many factors that can both affect and remedy issues it is a good idea when considering coverings as a fix to look at Construction Industry Research and Information Association Report (or CIRIA as it is also know). When removal is the chosen fix, this normally involves the excavation of contaminated material. This can be either concentrated on the affected area or excavated to a depth so that a cover can be applied and the material that has been removed is then replaced with new (note: New fill will also require checking for suitability). In terms of a landfill, the act of certain micro-organisms breaking down organic materials produces methane gas and also some carbon dioxide. Methane can also be produced by organic rich soils such as peat. In areas where any of the above situations occur, a site inspection and risk assessment will be required to ascertain the level of gases and to what extent they may affect any building or property. If the potential presence of gas is found to be far too much then this will need to be considered during the planning and design stage of the build. Depending on the extent of the gas issue, the control measures needed may be isolated to specific areas or they may need to cover the entire site. Typically found in locations where traces of Uranium and Radium are found, radon is a naturally occurring radioactive gas that is both odourless and colourless making it almost impossible to detect without a professional Radon risk report. Radon generally tends to be quite isolated to the West Country area of the UK, especially when it comes to high levels of radon. Typically, it radiates from the ground upwards and into the buildings and structures above requiring prevention work to be carried out to aid in reducing high concentrated levels that could pose a significant health risk. One final item to deal with in this section is that of vegetation and trees. Before construction starts the area where the building is to go needs to be cleared to such a depth that any regrowth is prevented. The potential for tree roots to start growing into damage foundations could seriously affect the stability of a structure and also any service or drainage pipework. As you might have guessed, this section of the document focusses mainly on drainage and things such as damp proof courses etc…. The main point of this section is to ensure that a building has correct drainage and any excess surface or foul water is removed and also that moisture present in the ground cannot seep into floor slabs and up and into walls. This section does not apply to areas that are subject to flooding or have a history of flooding. The rules state that where the water table is subject to rising within 0.25m of the ground floor then adequate drainage needs to be put in place that either drains through gravity or through another approved means. Where there is the potential for groundwater or surface water to potentially affect the structural stability of a building, site drainage should certainly be a consideration. If the building or property features a basement or cellar area and the foul water drainage also takes rainwater then there could be the potential for sewage waste and excess water to infiltrate this area. For guidance on potential solutions you will need to refer to Approved Document H. Additionally, for information on blockage and backflow prevention please refer to the CIRIA publication. Construction inevitably involves excavation of some form and this in its nature can alter groundwater flow and the soils ability to deal with water as it once did. Where contamination is also present, drainage may be needed to ensure that these contaminants are not able to access foundations or services. The guidelines within this section are broken up into five sub-sections in order to cover the most common floor types. It is also stated that floors of this type should ensure that their actual structure and thermal performance are not affected by interstitial condensation and also that they should not allow any surface condensation or growth of mould. As the guidelines are pretty specific on how floors of this type should be constructed, please refer to Section 4.14 and Diagram 5 onwards of Approved Document C for more information. Where a suspended concrete ground floor is the preferred choice of floor and it consists of either precast concrete or beam and block, it will need to prevent any moisture from travelling into the floor above and its structural integrity will also need to be retained and resist the effects of any moisture. To clarify on what constitutes as a wall – this includes columns, parapets, piers and also chimneys if they are attached to the building. One consideration that will need to be taken into account is that in situations where a structure will be used for the storing of goods, as long as anyone entering the building will only be moving goods in and out and looking after the goods themselves and that no adverse effects to health and safety would occur, then parts 5.2(a) and (d) of Section 5 of Approved Document C may not apply. The final section of this document deals with the roof area of a building and covers situations where a roof is exposed to the outside elements such as precipitation (rain and moisture), where they may be at risk from interstitial condensation and where there is a risk of condensation and mould growth on the internal surface of the roof. The above information should be used as a guide only. If you are referencing Approved Document C in relation to planning or a construction project please ensure that you are referring to the most up-to-date guidelines that can be found by downloading document C on the link at the top of this page from the Planning Portal website.